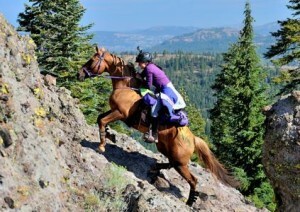 When she accepted a dare by a friend to compete in the 100-Mile One Day Western States Trail Ride, also known as the Tevis Cup, JayaMae Gregory didn’t know it would take three years to accomplish. And, JayaMae didn’t know she really should have been riding an Arabian, not a Missouri Fox Trotter, when she came in 66th out of 107 finishers in one of the world’s most difficult equestrian races. Nevertheless, on August 10, at 3:59 in the morning, when Foxfire’s Little Britches, who JayaMae calls “Asali,” crossed under the Finish Line banner, she was the only Fox Trotter to successfully finish the 2014 Tevis Cup. Only two other Missouri Fox Trotters have completed the traditional Tevis Cup: Linda Larsen finished it on Levi’s Bliss in 1979 and High Peak Red, ridden by Frank Howe, finished the race in 1972. The Tevis Cup Ride, which entices riders from all over the world, begins south of Truckee, California, crosses the crest of the Sierra Nevada mountains and routes through Squaw Valley before ending at the town of Auburn, California. Usually fewer than half of the riders finish this daunting ride. JayaMae, who lives in Paradise, California, had ridden hunter jumpers but had never been on a gaited horse before being asked by a friend to exercise Asali, who is by Foxfire’s Rowdy Gold and out of Foxfire’s Black Bess. 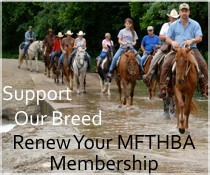 But she grew to love the 14.3 hand mare, who “always wants to go. She’s incredibly willing to please,” said JayaMae. 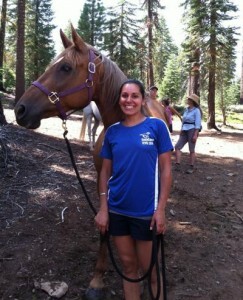 JayaMae was able to purchase Asali, and the two set out together on their journey to the Tevis Cup. 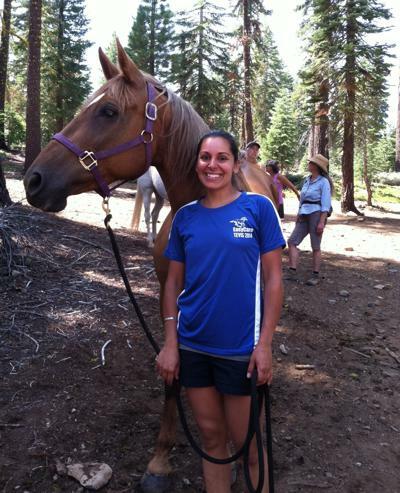 “I read a few endurance books, joined the American Endurance Ride Conference (AERC), and jumped into the sport head first,” said JayaMae. “I showed up to my first ride completely ill-prepared, but two veteran riders came to my rescue.” Despite a few mishaps, “I was hooked,” said JayaMae. It took the pair two years to qualify for Tevis. Asali and JayaMae worked as a team during the competition. In the rugged Devil’s Thumb canyon, which has an 1800 foot drop over two-and-a half miles, JayaMae walked down the canyon, leading Asali. To get out of the canyon, she grabbed hold of Asali’s tail and the mare pulled her back up. Being out in these mountains with Asali meant a lot to JayaMae. “Being on horseback in this remote, rugged terrain so packed with history was a magical and spiritual experience,” she said. In February, to help prep for the Tevis Cup, JayaMae and Asali successfully tackled their first 100-miler, the Twenty Mule Team 100. Six weeks after Tevis, they competed in the Virginia City 100 in Nevada. The three rides together totaled 300 miles for JayaMae and Asali. “We have a 100% completion rate so far this year,” said JayaMae. “I was told that Asali is one of only six Missouri Fox Trotters to complete a 100-miler, and now she has done three. I love my horse!” exclaimed JayaMae. On the AERC page showing the Western Region Lightweight Division standings is a list of the top ten competitors. There are eight Arabians, one mule, and one intrepid Missouri Fox Trotter, Foxfire’s Little Britches.